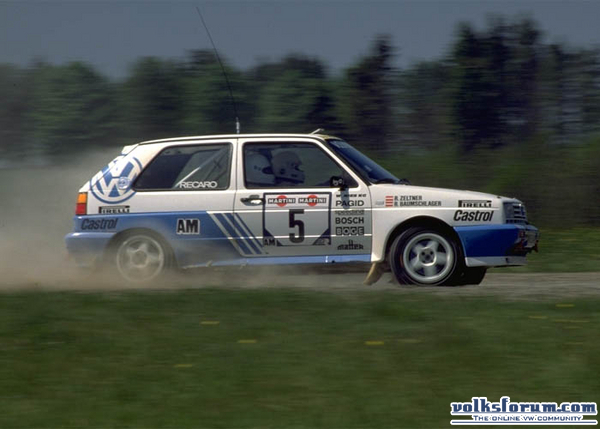 In 1986 Volkswagen wins the World Title for Drivers with Swedish driver Kenneth Eriksson in a Volkswagen Golf GTi 16v in Group A trim. 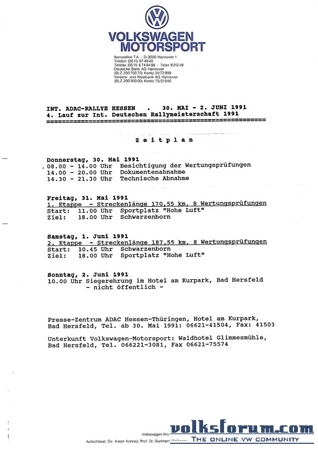 In 1986, not Group A, but Group B is drawing all the attention. Due to a minimum of technical regulations, Group B offers the teams a nearly limitless playground in which they can build really vigirous machines. Cars like the Audi Quattro, Ford RS200 and the Lancia Delta S4 competed in the Group B Rallies. They where delivering up to 600 BHP in those days and manufacturers such as Porsche and Ferrari where even developing cars to start in the 1987 season as the series drawed a huge amount of spectators and media-attention. 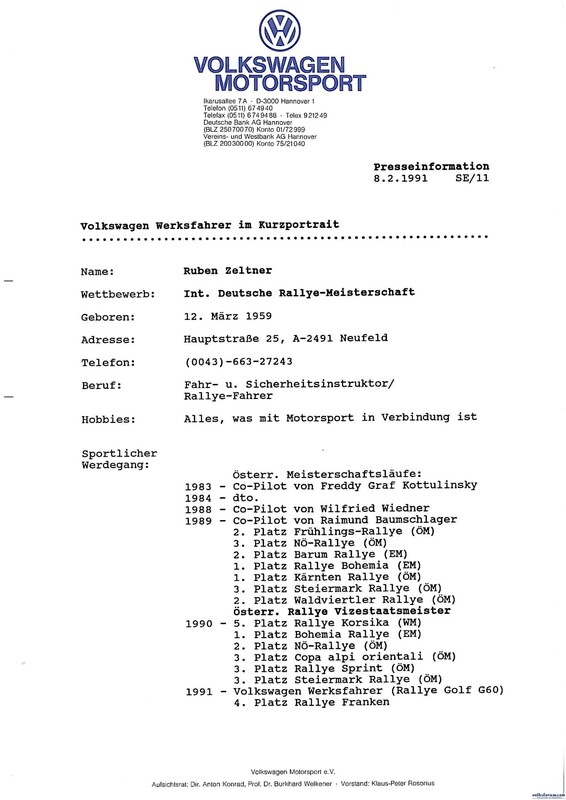 Unfortunatly there were some severe accidents with fatalities in the 1985 and 1986 season, which made the FIA decide to stop the Group B Class at the end of the 1986 season. 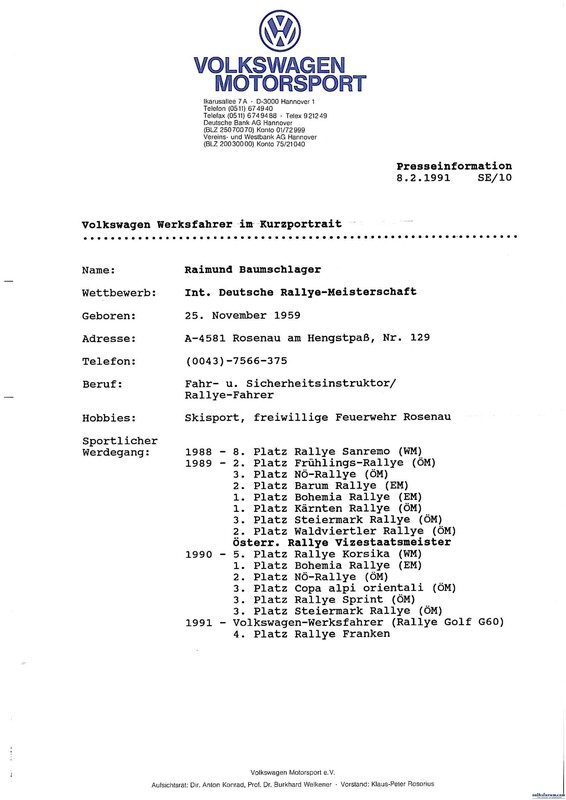 In 1988 brainstorming began on the new car. It had to comply with Group A regulations and needed 4WD and a super- or turbocharged engine to compete with Lancia. Group A regulations also meant that there had to be a Series-production of at least 5000 cars. 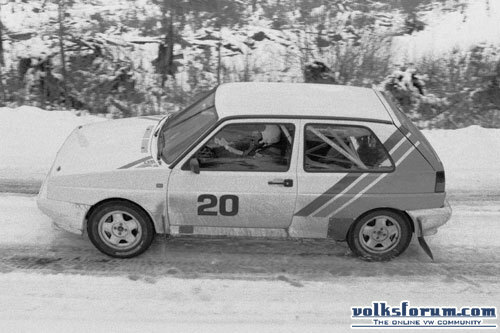 The decision was made to take the MKII Golf as a base-modell on which the Rally-car had to be developed. 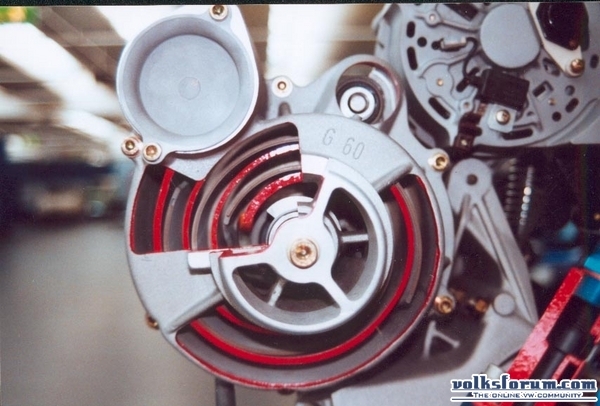 The 1.8 G60 engine of the Corrado would be the powerplant underneath the hood. 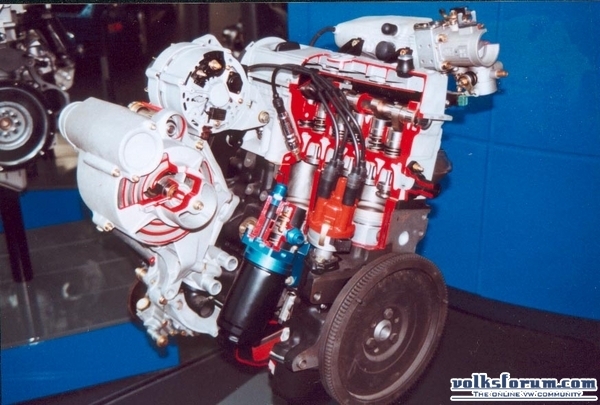 In the mid 80's VW developed the Syncro-system, this would make a nice 4WD system for the rally-car. 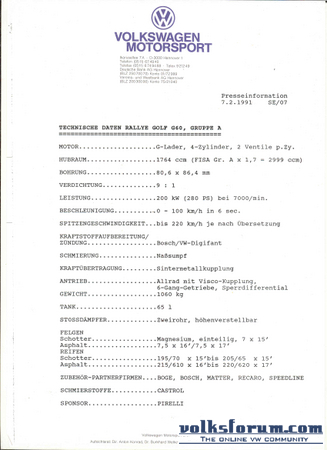 Early 1988, development on the Golf Rallye starts. Due to the fact that the car was made up of different parts already used in the Volkswagen-concern, development rapidly moved forward. In the meantime, Lancia was dominating the Group A season, winning 10 out of 13 races. 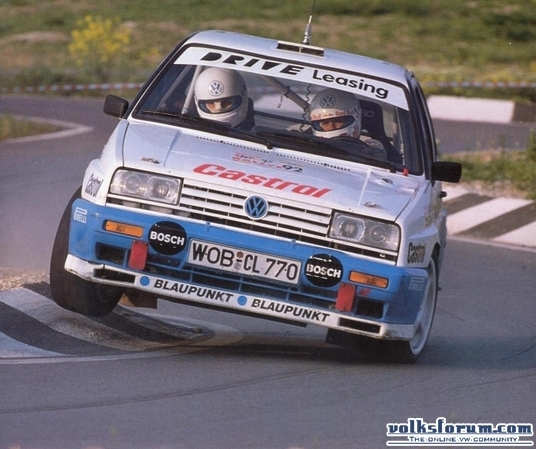 Volkswagen was nowhere to be seen, still driving the 2WD GTi 16v which had to compete with cars such as Ford Sierra RS Cosworth and Nissan 200 SX. 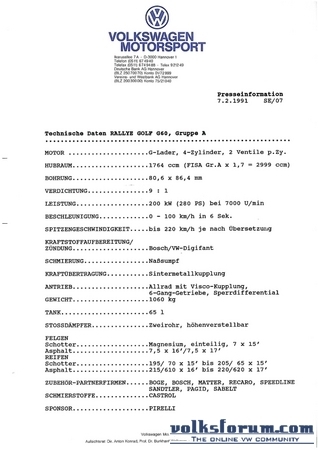 Fall 1988, the VW Golf Rallye production model was launched at the Dealers. Equipped with a syncro 4WD system, 1H 160 BHP G-Charger engine, widened wheel-arches and a special Recaro interior, it proved to be a dream to each car-enthusiast. 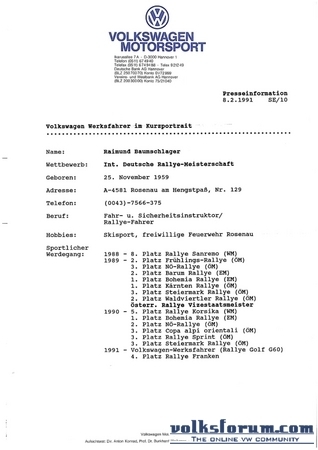 Meanwhile Volkswagen Motorsport (VWMS) was receiving their first Rallye's to convert into real Rally cars. VWMS decided to build a Group A car, while this championship was the most appealing at the time. Later on, there would also be a Group N version, which had to be more like the production model. The Group A car was homologated on the 1st of December 1989. Lancia was almighty, again they won both the Constructors and the Drivers Championship. Volkswagen ended up 9th in the Constructors-championship. So on the 4th of April 1990, the WOB AZ 144, drove up the starting ramp in Sardine not knowing what would happen next. Volkswagen blew the entire competion away on the first day. 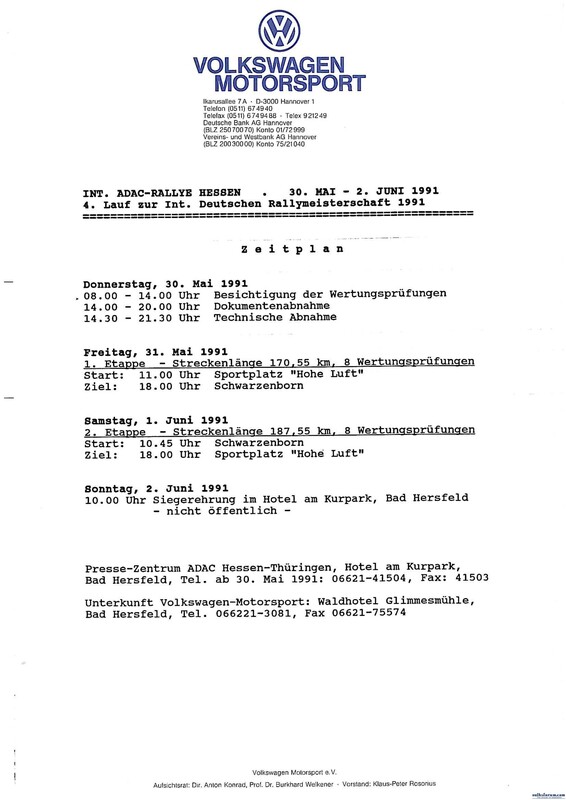 The three stages driven on that day, all ended up in Erwin Weber's hands resulting in a firm 1st position at the end of the day. Needless to mention that Lancia aswell as the worldpress were shocked. 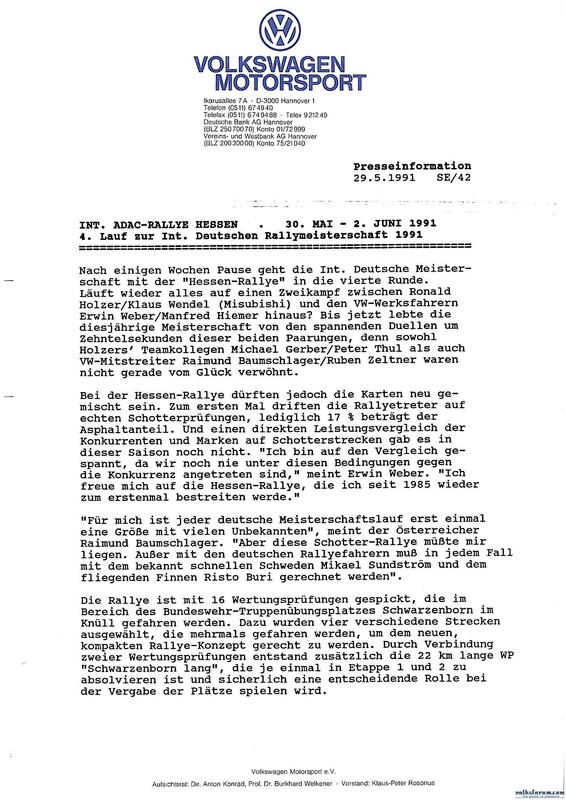 What had VWMS been building in their Headquarters in Hannover. VW ended the Costa Smeralda on a 6th place. 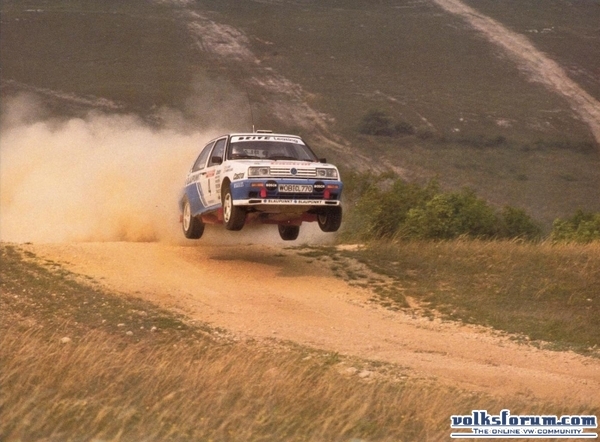 As promising as the start in the Rally Costa Smeralda, as disappointing was the rest of the 1990 season. 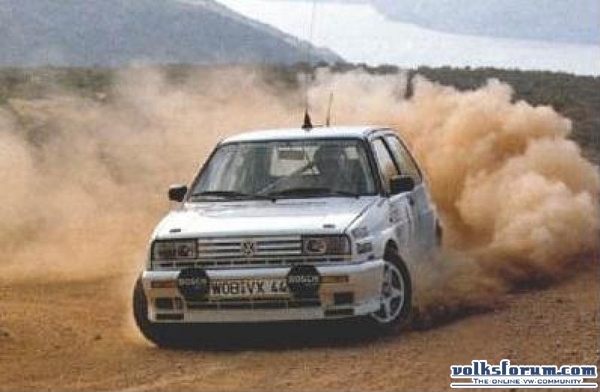 Volkswagen was unable to keep up with the pace of the other competitors. 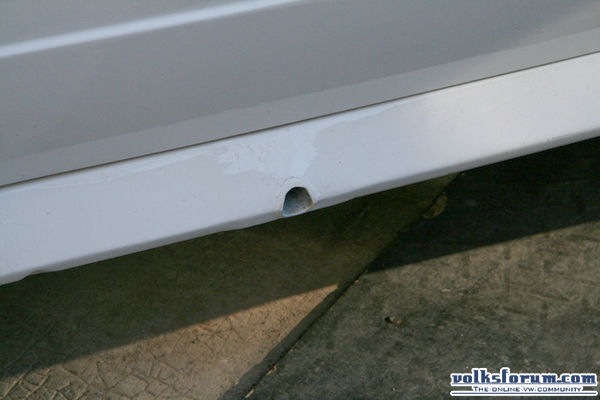 The main reason was found in the reliabilty of the car which proved to be dramatic. Best result of the season was a 3rd place in the New Zealand for Erwin Weber. 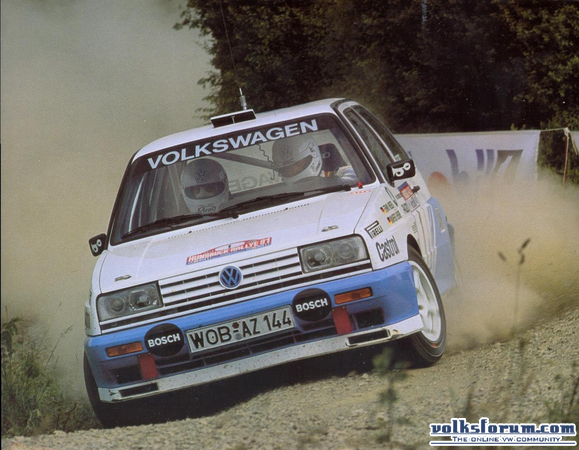 As 2 litre engines were allowed again in the 1990 season, VW had no real chance in driving up front. 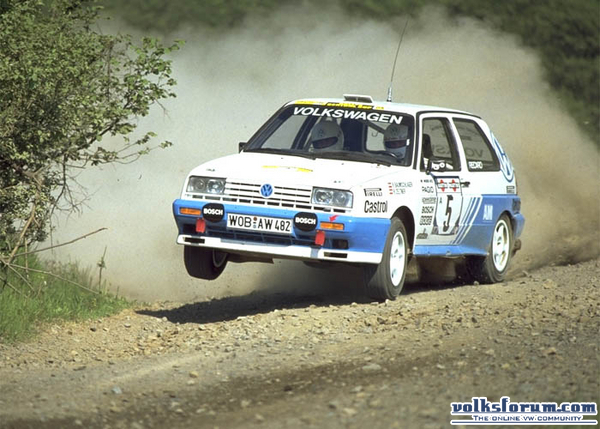 This meant that Volkswagen would resign at the end of the 1990 season in WRC Group A Rallying. 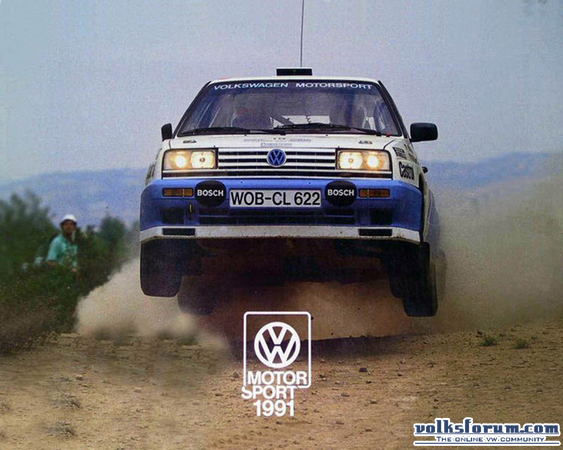 The end of VWMS in the WRC didn't meant that they gave up on rallying. 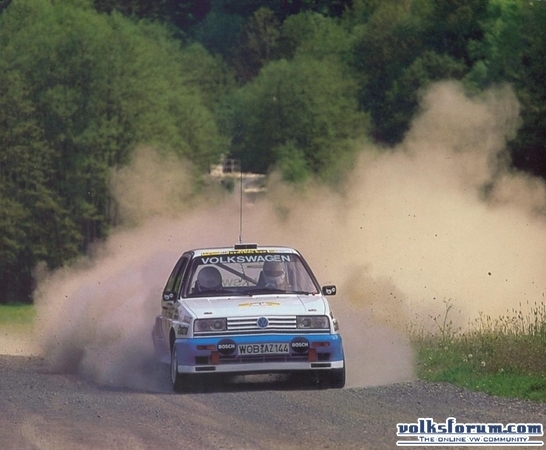 In 1991 they started in the German Championship with the Golf Rallye and Weber and Baumschlager as their 2 drivers. VWMS proved to be dominating. 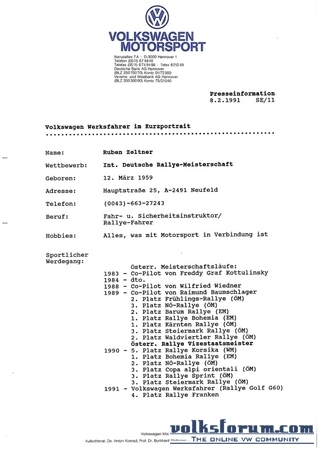 They won the 1991 championship, both Constructors and Driver (Erwin Weber). 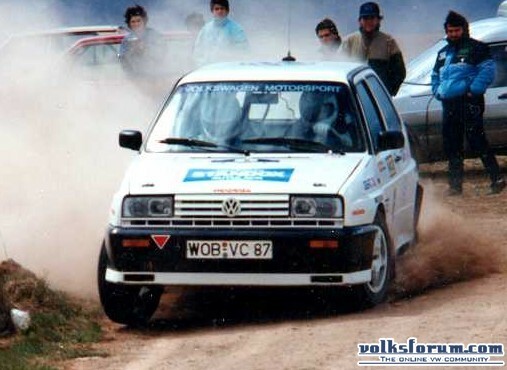 At the end of the succesfull 1991 season, Volkswagen decided to stop Rallying and this also meant the end of the Works-team. 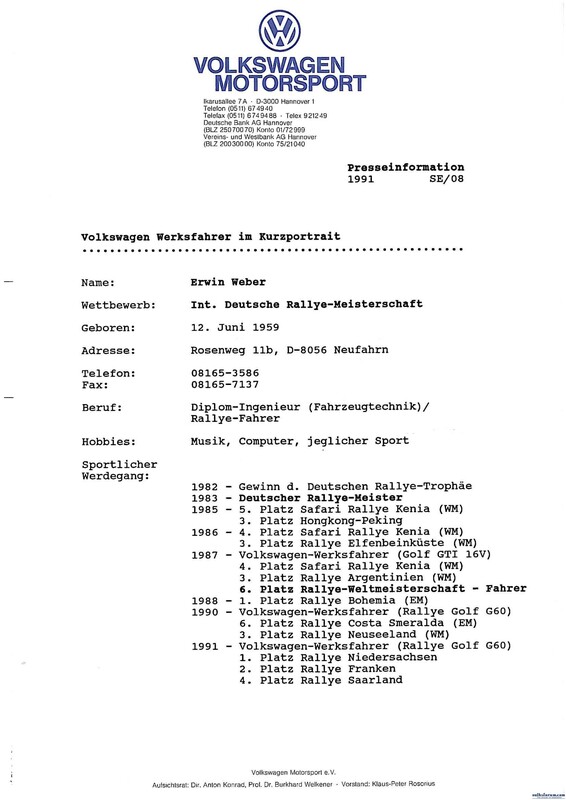 Eversince there have been several VWMS Rallye's used in rallying, but never again by the Works-team. 4WD, 6 speed dogbox with hydraulic clutch. Independent suspension on al 4 corners. 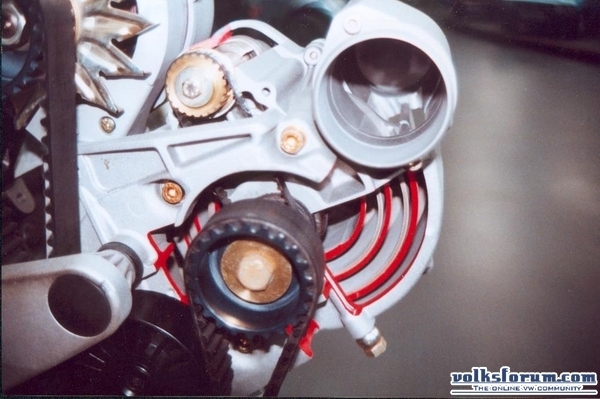 325mm front-brakes, 280mm on the back. Last edited by VeeDubber : 31-08-2008 at 13:24. If you search the web for Rallye's on a regular basis, you are familiair with terms such as "Genuine VW Motorsport Shell" or things like that. 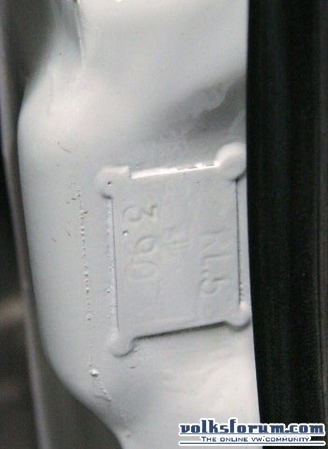 The real VWMS Bodies have a few "Tells" with which you can identify "the real deal"
2) There is a jacking-point in the sideskirt. OK guys, that's it for now. If you have comments or suggestions, please let me know! PS: As you can see, I don't have pictures to all the VWMS Rallye Tells above, if anyone of you has them; do not hesitate to contact me! 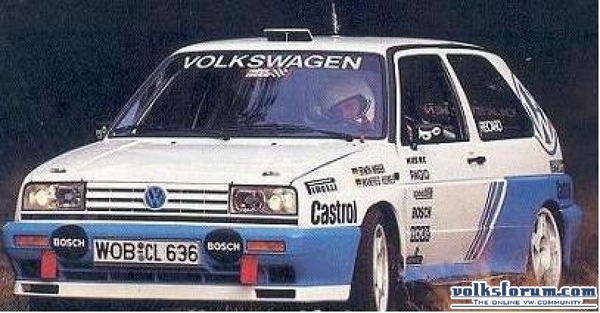 I know that a couple of Rallyes went to USA, I once read an article on them in VWTrends back in the early 90s. 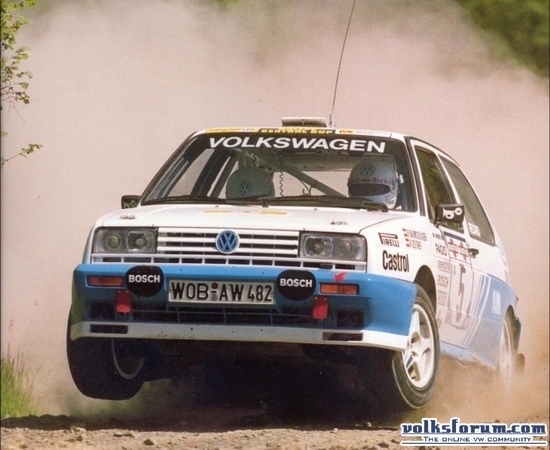 I can't for the life of me remember the name of the driver and his team, but IIRC, his cars were genuine VWMS cars with the correct VWMS colors, and probably the only true US-spec Rallyes ever. I don't know if these cars were Gr.N or Gr.A, but I thought I should mention them. 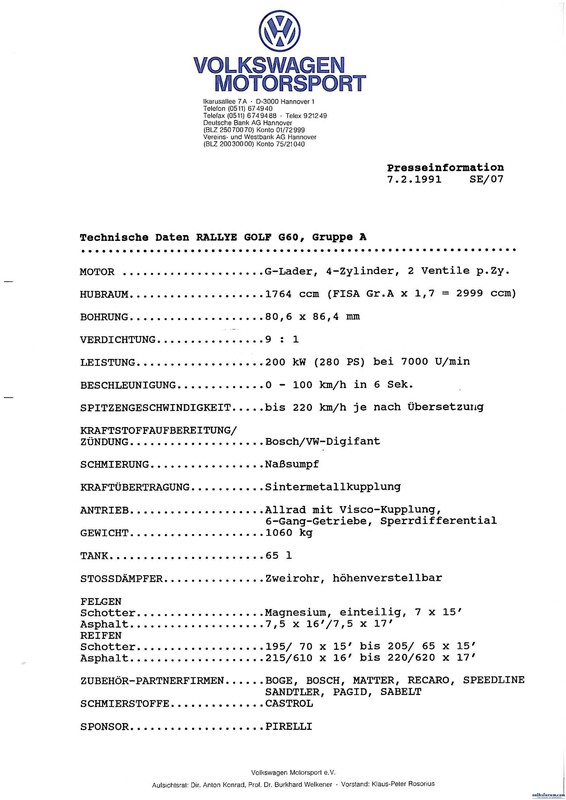 The FIA permitted a normal aspirated engine with a maximum of 3 Litres or a charged engine of equal calculated volume. To calculate this volume, the capacity of the engine is multiplied by 1,7.
aaah, so it's the number the FIA came up with to compare blown engines to NA.. I received some information of a Rallye-enthousiast from England. 37th Rally Acropolis 03/06 - 06/06 WOB CL 622 Erwin Weber/ Matthias Feltz car 15 retired after stage 18 due to water pump failure. 3rd Commonwealth Bank Rally Australia 20/09 - 23/09 WOB CL 636 Erwin Weber/ Matthias Feltz retired after stage 27 in car 10 after being excluded. I think they were pushed out of a control zone when an electrical fault cut the engine. Costa Smeralda 04/04 - 06/04 Erwin Weber/ Matthias Feltz WOB AZ 144 6th in 4h.43min.31secs. Winner in 4h.35min.43secs. March 30-31, 1990 Sunriser 400 Forest Rally GpA Tim O'Neil / Martin Headland dnf car 4. April 28-29, 1990 Rim of the World GpA Tim O'Neil / Martin Headland 2nd car 4. May 12, 1990 Tiadaghton Trail PRO Rally GpA Tim O'Neil / Martin Headland dnf car 4. June 1-3, 1990 Susquehannock Trail PRO Rally GpA Tim O'Neil / Martin Headland dnf car 4. August 24-25, 1990 Ojibwe Forests Rally GpA Jean-Paul Perusse / Martin Headland 3rd . October 26-28, 1990 Press On Regardless GpA Tim O'Neil / Martin Headland dnf. 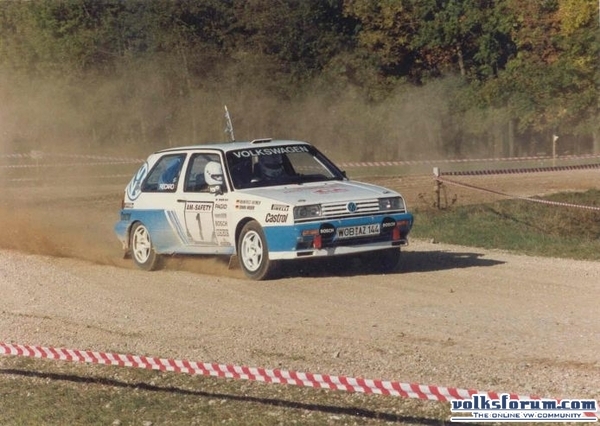 Nov 9-11, 1990 Coachman Stages PRO Rally GpA Tim O'Neil / Martin Headland 1st car 4. April 19-21, 1991 Rim of the World GpA Tim O'Neil / Martin Headland dnf car 6. May 3-5, 1991 Tiadaghton Trail PRO Rally GpA Tim O'Neil / Martin Headland 2nd car 6. June 1-2, 1991 Susquehannock Trail PRO Rally GpA Tim O'Neil / Martin Headland dnf car 6. Scott Fuller and Ben Bradley ran an ex Vince Wetton (UK) car in 1996. February 24, 1996 Doo Wop I PRO Rally Scott Fuller / Ben Bradley 1st car 20. February 25, 1996 Doo Wop II PRO Rally Scott Fuller / Ben Bradley 3rd. 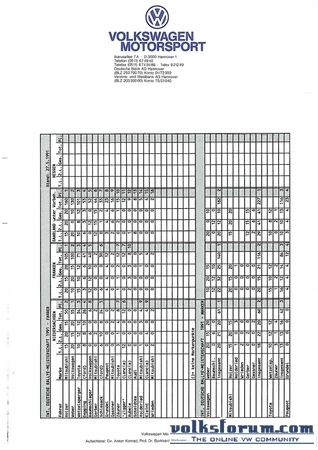 Nov 8, 1996 Tour de Forest Scott Fuller / Ben Bradley 12th. 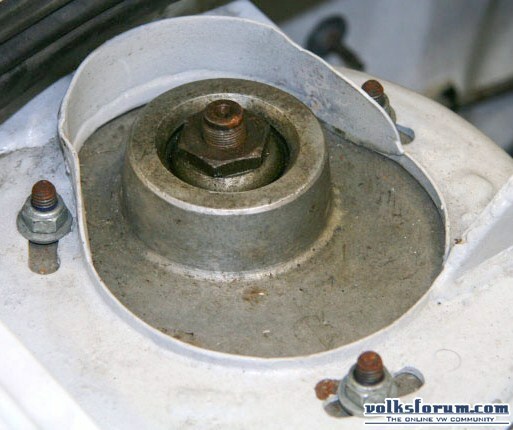 Mark a big TY from the Volksforum Crew for your information! 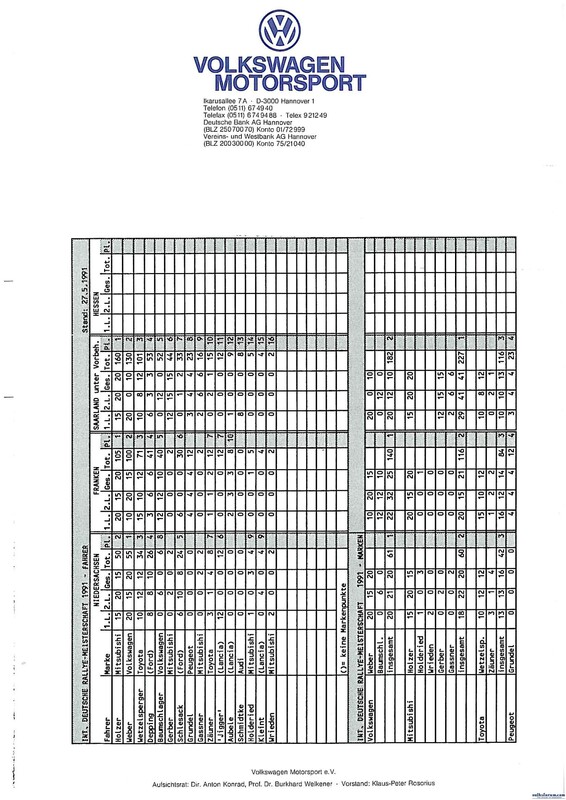 Some info is missing, we would like to see it completed, so contact me if you got more info. WOB AZ 144 Weber Heimer 2nd +1min27 (Winner 1hr21min25sec). WOB AW 482 Baumschlager/Zeltner 4th +2min16sec. WOB AZ 144 Weber/Heimer 5th +5min03sec (Winner 1hr27min57sec) Co-driver side of car all smashed. WOB AW 482 Beck/Feltz ???? 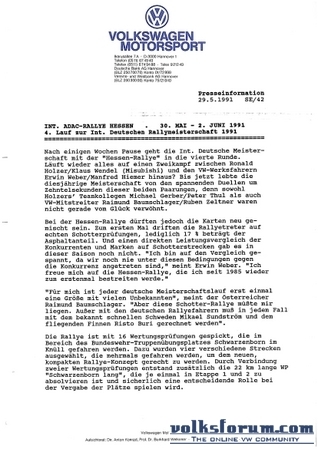 Also a press-release on the 1990 3 Städte Rallye. The first appearence of the Rallye Golf in the DRM Championship. 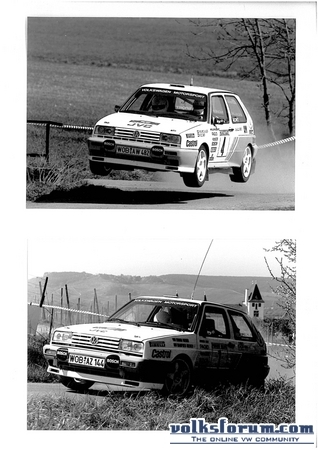 Because the images are to big, you can view them in the Rallye Golf Database. Ah, yes, Tim O'Neil was his name. 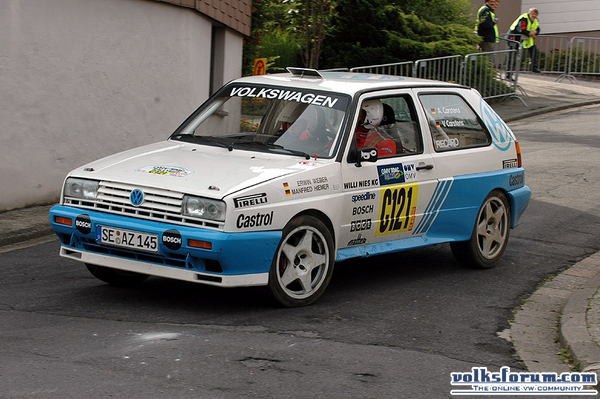 And, the car you see in the picture is something as rare as a true US-spec Rallye Golf. Notice the side marker light (above the Sachs logo) and US-spec Corrado headlights. A French guy has bought one the CL 622. 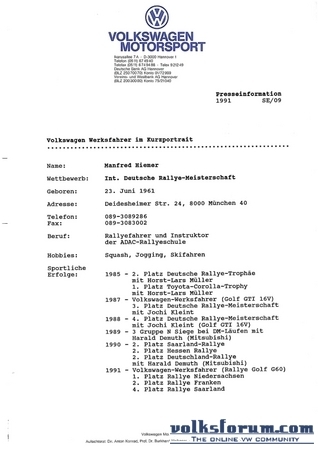 A big Thank You goes out to Ruud Buitendijk from Ruud's VW Shop who has made this possible by placing the Original Press Information to our disposal.